My father met the Rolling Stones somewhere on the road, the year he ran away from us. I picked up the garbage bag, tied it, and threw it into a corner. “Dad didn’t tell me a lot of things, Danny.” Dust danced in a ray of sunlight as the bag landed near a window. His trip out West—now, that was something that I did know about. It was not long after he had taken me fishing, and told me—right there on the banks of the Illinois River—how he would be going away for a very long time. To a ten-year-year-old, a very long time was somewhere between lunch and supper and supper and breakfast. This was just right after he had helped me reel in what turned out to be a five-pound catfish. “I got it, Daddy, I got it, Daddy,” I said excitedly. He stood behind me and ever so carefully, as not to damage my confidence, took hold of the pole and helped me reel in the fish. Together we watched it flapping around, mouth and gills gasping, at the end of the line. And then he sat me down on a rock and told me he was leaving. He had made some peanut butter and jelly sandwiches, wrapped in waxed paper; he handed me one, but I wasn’t hungry. They were too warm and soggy. “When are you coming back, Daddy?” I blinked back the tears. Except, there was never any mention of The Rolling Stones. The amount of embellishment was proportionate to how much or how little he had to drink that year. One year he described how he hadn’t eaten since St. Louis. Another year, he threw in that he stole an apple pie cooling on the windowsill of a farmhouse he passed on the outskirts of Rolla, Missouri. Well, not actually stolen, my father added. He left a note with his address in Illinois and the promise that he would send the money once he found work. I think that might have been some scene he saw in a movie and tailored it for his story. Probably drunk someone snorted, followed by laughter. Those expecting a more dramatic ending might have been a little disappointed with what followed next. There had been a few groans and sighs before someone turned on the football or basketball game. If it hadn’t been my father who had run away, it might have been a good story. Perhaps, the kind of story if we had heard we could have laughed about it over a couple of beers ourselves. It wasn’t entirely my father’s fault, though for never talking about the time he met the Rolling Stones or caught a line drive foul ball off the bat of Ernie Banks at Wrigley Field. They were not the kind of stories he could bring up when we did get together during his monthly visits. No, I never recalled him talking about anything out of the ordinary. With Mom sitting in the kitchen and listening in on the conversations we had with our father, he kept it simple. His repertoire of questions was relegated to asking about school and what we wanted for our birthdays. Before he came over though it was my mother who did all the talking—prompting Danny and Me what to say and what not to say. The few times that he managed to get us out of the house alone he was generally quiet. He always dressed up when he came over in a nice pair of slacks and shirt. Even when he lost his job at Caterpillar, he still made sure to at least make a good impression during those monthly visits. Then there were all those awkward Christmas mornings when he came over to pick us up to take us over to our grandparents’ house; the birthday’s that he’d remembered; the occasional camping or fishing trip that were meant to fill in for all the parenting he had missed. We went through the motions of being father and sons. I think Danny was lucky. He was too little to remember. What I remembered most, though, was him leaving. That much had been ingrained in my young, impressionable mind I guess. He used the excuse of going fishing to get me alone so he could tell me that he was leaving and that he might not be back for a long time. Later, my father and I were just friends. I went into the Army. We had our beers when I was on leave. “Hey, everyone, this is my son. He’s in the Army.” Then, after I got out of college, we had our beers again. Dad cashing in on being the father of a college graduate. Of course, he hadn’t given me a dime. Still, I let him celebrate. Over the years, we still saw each other on the holidays if I was in town. There were still the birthday cards or phone calls and later email to stay in touch. But by then we had drifted so far apart that not even the Stones could have saved us. Danny and I had the onerous task of going through most of the stuff that our grandmother had collected over the years—stuff she picked up on all the trips she took with our grandfather—no doubt despite his constant protestations that it was, after all just junk. “Probably made in China,” he would murmur with a hint of sarcasm in his voice. His most famous utterance to anything he felt was inferior. Dad didn’t have the heart to tell Grandpa Pete, who recently took up residence at the Prairie View Nursing Home, he had to sell the house. I remembered Grandpa Pete always going on and on about how he had worked his whole life for the house and how happy he was the day in 1970 when he finally paid his last mortgage payment. Now, he was going to lose it without even knowing about it. Grandma’s medical bills had drained his bank account and had started to draw on my dad’s. When his two older brothers Bob and Ray couldn’t help out, everything fell on my father’s shoulders, and it had started to wear him down. I could see that Dad was in a foul mood when he pulled up in the truck he borrowed from a buddy to haul everything to the landfill. He was coming back for the fourth trip now and with each additional trip, his mood soured. Most of the stuff that had not been carted off to the landfill was going to be put in storage, the rest burned. “You guys about done?” he asked, getting out of the truck. One thing my father and I both agreed on was that we hated to see the house go. My father had grown up in the one story, prefab house Grandpa Pete built in 1946, and I spent many summers here. Even though Mom and Dad got divorced, as soon as school ended in June, my grandparents would pick me up, and I would stay until the beginning of August. I know it broke Dad’s heart as much as it did mine to have to sell the house. Even without grandmother’s medical bills the month she was in the hospital before she passed away, the house was just too much for my grandfather to take care of, especially after having a minor stroke a few years ago. Danny said he had to get back to Chicago. After my father had taken the last load to the landfill, we met up at the Rainbow Tap about a mile down the road. We were on our second beer and waiting for our chicken dinners: a quarter dark with a side of fries, salad, and a chunk of Vallero’s Italian bread. Three guys seated at the bar were watching some bowling tournament. We had a table off to the side, close to the kitchen. I watched my father shook some salt into his beer, something he learned from Grandpa Pete and watched the foam rise in the glass. I wasn’t quite sure about the science behind this beer trick. It was fun to watch, though. “It would’ve been cool to know that my old man met the Rolling Stones,” I said. “It might have been something to me,” I said. My father stared at me from across the table. He raised his hand as if to point at me but then grabbed his beer. He shook his head and took a drink. He was too tired to get into it over the Stones. I was not about to let him off too easy, though. There was still one question that one question that I had always wanted to ask him. Maybe it was not the best time to bring it up, but this was just as good a time as any. Suddenly, I was that ten-year-old on the banks of the Illinois River and this time I wanted to know why. There, I finally said it, but I should have chosen my words more wisely. My father glared at me and rubbed his chiseled chin. Someone dropped a metal pan in the kitchen. We both looked in the direction of the kitchen and then turned back to the table. My father sighed deeply, as he leaned forward, placing both arms on the table. My father stared at his beer and then looked up at me. The past two months had been rough on him with Grandma Loretta passing away and having to put Grandpa Pete in a nursing home. I studied my father’s face. All those years I never really looked at my father closely. Most of the photos I had of him were of a younger man. Now, he looked so tired. My mother, known more for her stubbornness than her openness, especially when someone crossed her, never talked much about why she divorced Dad, but for years, the bitterness she had in her heart for him, ate at her more than the cancer did. She could be mean and unforgiving when she wanted. My father never stood a chance. “You know, all those times when I came over, it really hurt me that I could only get to see you once a month or on holidays,” he said slowly. “One time, not long after the divorce, I was late sending her the support check, so I decided to bring it over. She wasn’t home—you and your brother were at your grandparents’ house at the time—but I spotted her car outside Norma’s Diamond Horseshoe Inn. I was foolish to go in there, but I feared her wrath more if she didn’t have the check on time. Funny, when I’d waited so long to finally hear my father’s side of the story it made me feel sad for him. To think he had kept this inside of him all these years. And if it hadn’t been for the Stones, I probably would have never known. I wasn’t ready for that revelation. As a kid, I was always curious about why my father’s last name was different than his brothers. Of all the things my father and I did talk about in later years—when I was old enough to know better—the two things we never talked about was the divorce. The other was that my father was adopted. From what I pieced together over the years, my grandmother’s first husband had run out on her when my father was just a baby. He probably couldn’t handle having to take care of one more baby during The Depression. Though my father’s older brothers went to stay with an aunt, Grandpa Pete adopted my father not long after he had married my grandmother, just a couple of months after World War II ended. My father never knew his real father. One Christmas, when I was fifteen, I asked my father why his last name was different from my uncles’ last names. Just like his trip out west I thought at the time and left it at that. Now, I wasn’t going to let him off the hook. What we should have talked about years ago was finally going to see the light of day. We ordered another round of beers and another plate of chicken and french fries. The bowling tournament was replaced by some fishing show. Two men were casting their lines from a boat in the middle of a lake hemmed in by towering pines with snow-capped mountains in the background. “Oh, he’s going to get away,” yelled Brad from the television. My dad, who was an avid fisherman himself, had momentarily gotten caught up in Brad’s struggle with the Pike. He shook his head and muttered, “Tsk, tsk” when it appeared that the fish was going to get away. “Amateurs,” he mumbled and turned back to me. “So what did you find out?” I asked. It was the first time my dad had ever said he was sorry. It was getting late, and my father still had an hour drive home after he returned the truck to his friend. Someone opened the door, and a blast of wind rushed in. My father and I turned to see the gray sky threatening rain. It’s a good thing we finished when we did, I thought. Maybe if it got any colder, it could snow. “You wouldn’t want to come over for dinner,” my dad said, putting his hand on my shoulder. My dad and I looked at the TV and grinned. On the fishing program, the camera panned to the right showing Brad holding up the fish. Standing next to Brad was his father. “Now that’s one very proud father and his son,” the narrator added. 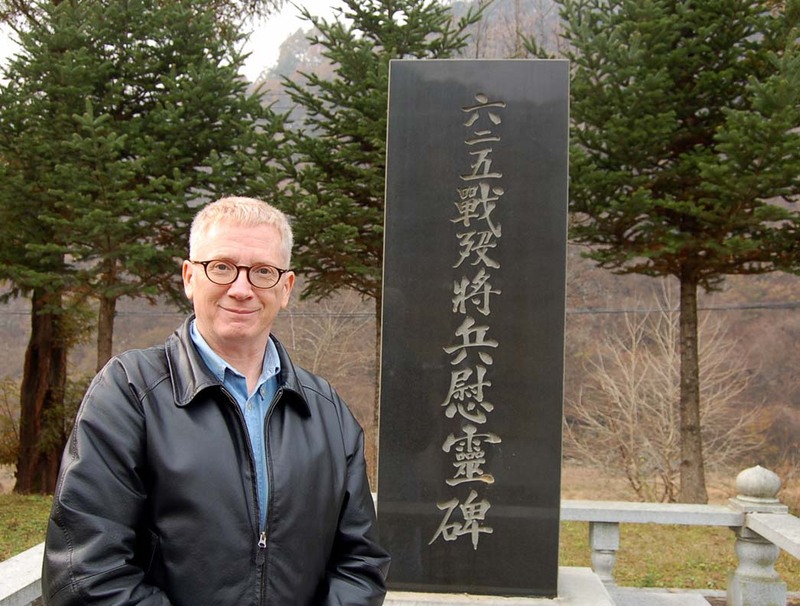 Jeffrey Miller has spent over two decades in Asia as a university lecturer and writer. Originally from LaSalle, Illinois, he relocated to South Korea in 1990 where he nurtured a love for spicy Korean food, Buddhist temples, and East Asian History. He is the author of eight books including War Remains, Ice Cream Headache, and The Panama Affair. He lives in Daejeon, South Korea with his wife and four children. If he’s not working, writing, or reading, he’s usually chasing little kids around his home.